Description: This system will work with .223/5.56 x 45 mm NATO. For 300BLK - select Low Mass Carrier - Kit includes: - Patented One-Piece Bolt Carrier - .750 Picatinny Gas Block with 3 settings (full gas for standard fire half gas for suppressed no gas for single shot) - Gas Plug - Upper Receiver Bushing - Bushing Installation Rod - Bolt Spring - Drive Rod with Bushing and Spring - Installation Instruction Card - The Adams Arms Piston System: - A short stroke free floating piston system. - Is Self-Cleaning. - Carbon and gases are expelled forward away from operator. - Corrosive resistant coating processes. - Harmonics are not transferred into the barrel. - Adjustable gas settings for various applications. - Doesn't vent directly to atmospheric pressure; this eliminates flash signature and super sonic crack which is optimal for night vision and suppresses fire. 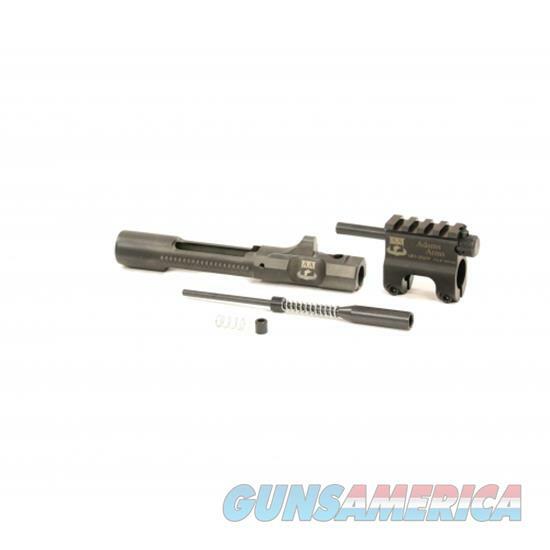 - This system requires a pistol gas length (4.846 from barrel extension to shoulder) and a .750 gas seat. - We recommend using a standard barrel nut or barrel nut with similar measurements for proper fit and function of the kit. Many aftermarket proprietary barrel nuts do not offer the clearance for the drive rod or proper seating of the spring and bushing.